In this section, we'll discuss your first building and provide helpful tips and resources. Purchasing your first steel building is an exciting milestone in any person's life. For some, the process may also seem very intimidating. That's why our representatives are available to help guide first time builders and do it yourselfers and answer any questions they may have. Please don't hesitate to give us a call toll-free at 800-345-4610. How Much Building Can I Afford? Typically, the first question would-be first time builders ask themselves is, "What can I afford?" There are many factors that determine what a reasonable building price should be for an individual vs a small business owner vs a major corporation, including total savings, annual income, as well as additional costs like permitting fees and insurance. The number of options available for builders out there is endless as all of our buildings are custom and do not come off a cookie cutter assembly line, each unique design has their own unique advantages. For most first timers, we at Armstrong Steel highly recommend taking the time to analyze your needs. The distinct benefit behind building pre-engineered Armstrong Steel Building Systems is the enormous cost savings over traditional construction, often upwards of 40%. With that in mind, we frequently hear from our clients that they wish they had gone bigger. Save Up To 40% Off The Cost Of Conventional Construction All too often, first time builders concentrate entirely on building budget constraints. When compared to the whole lifespan of the structure, construction costs for the building itself only account for about 15% of total costs. Many first time builders learn the hard way by focusing on finding the cheapest pre-engineered steel building for their project because they offer the most square footage for their budget. However, the long-term savings afforded by a premium building system are an even stronger incentive for choosing Armstrong Steel. Stringent Qualifications Many first-time builders spend time searching for the cheapest building possible, which can make it more difficult to pull permits in the long run, pass local IECC (International Energy Conservation Code) requirements or lead to costly on site delays. No company in the industry offers a more powerful combination of durability, versatility, aesthetics and value and as always, Armstrong Steel Building Systems are backed by the best warranties in America. Details It's impossible to say where the engineering ends and the true beauty of our design begins. We obsess on solving the tiny issues, being unwilling to compromise in our quest to create a far superior product. Thousands of tiny decisions go into the development of Armstrong's designs and it translates to significant cost savings during the erection process. State Of The Art Armstrong Steel Buildings are fabricated in state of the art facilities. Our culture has embodied a sort of fanatical attention to detail. Most of our competitors are focused on making their product the cheapest. We think cutting corners to be the cheapest is misguided. A product should genuinely be better. This requires real discipline, and that's what drives us - a sincere, genuine appetite to make something excellent. Excellence Armstrong Steel Buildings are not made on an assembly line. Each building is designed by a small, handpicked team of designers. They are extremely close, focused and committed to the same goals: Excellence, Ease, & Simplicity. We want your building to go up intuitively. Just the way you'd expect. In addition to Armstrong's DirectBuy program, Armstrong Steel is proud to offer other purchasing options for builders. With an extensive network of Authorized Armstrong Builders throughout the country, we provide complete construction work in every state we serve, all from professional builders with advanced training in Armstrong Steel Building Systems construction. Their in-depth knowledge of our steel framing systems and specialized construction methods will help guide your building to a sound completion with efficiency and ease. The first step toward putting up the building of your dreams is locking in your steel price. This involves spending some time with one of our consultants, determining your building needs, and is followed by submitting an engineering payment to freeze your steel price and obtain your drawings. Armstrong Steel offers two ways to begin this process: You may either call us directly at 800-345-4610, or you can fill out our Armstrong Steel inquiry form online. Since every piece of your building is numbered to correspond with the erection drawings, the majority of our clients choose to erect their own building. But when you simply don't have the time, it's important to find an authorized Armstrong Builder that not only knows the intricacies of your project, but also understands your specific needs. Armstrong Steel has put together a nationwide network of expert builders who specialize in our products for just this purpose. 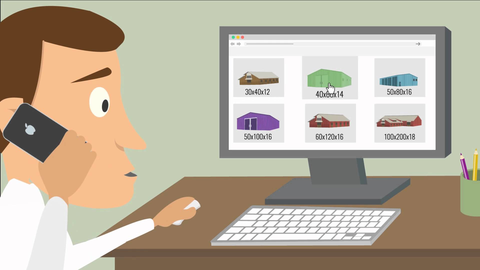 Armstrong's Virtual Steel Building System aims to educate and prepare clients as they prepare to purchase their building. Discover Armstrong is a simple and intuitive map that helps you discover unique Armstrong buildings and expert Armstrong builders. Forgive us while we continue development! Please understand, Discover Armstrong is in it's early BETA stages! Not all of our buildings, builders, or brochures can be found here yet! It isn't easy tracking down every building sold by our dealer network, hunting down photos of said buildings, etc. But we sure hope you enjoy the direction we're headed in! We've compiled a list of common questions and concerns from our customers as a resource for future builders.